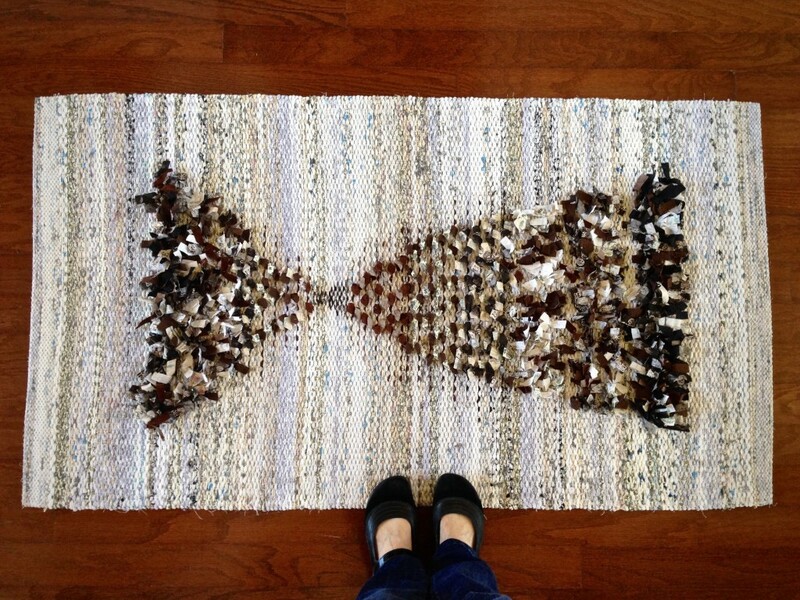 I wasn’t happy with a simple “X” for the design area, but I struggled to come up with something better for this rug. And then, Steve and I went to the symphony. There, on the floor, in the long hallway, was the inspiration I needed for the pattern design on this rug! 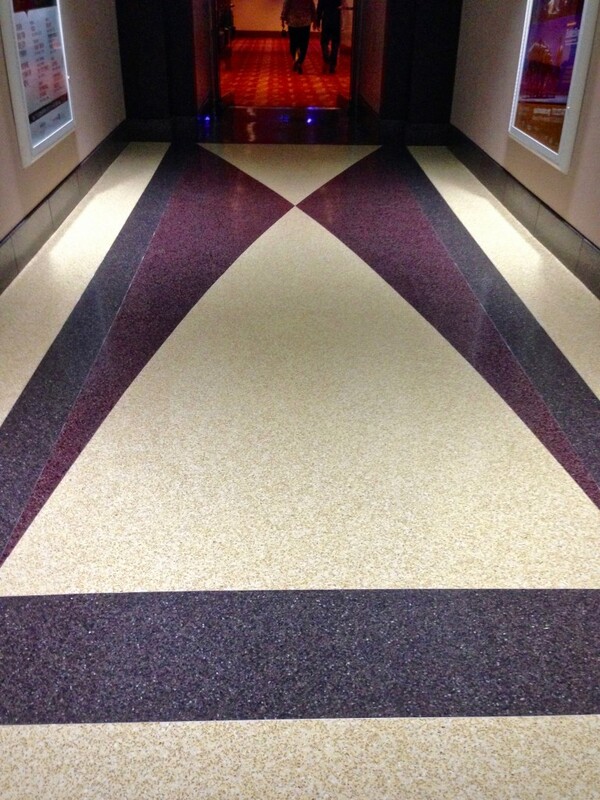 Design inspiration is found on the floor on the way to the symphony. Despite all that went wrong from the start, and how many things I had to undo and do over, I must tell you that I really did enjoy weaving this rug. The rya knots and loops made it fun and interesting. And this unique fluffy rug will always remind me of that sweet symphony date with my honey, when he patiently waited as I pulled out my iPhone to snap a few shots of the floor. Now that’s love. Counting warp ends on the warping reel. 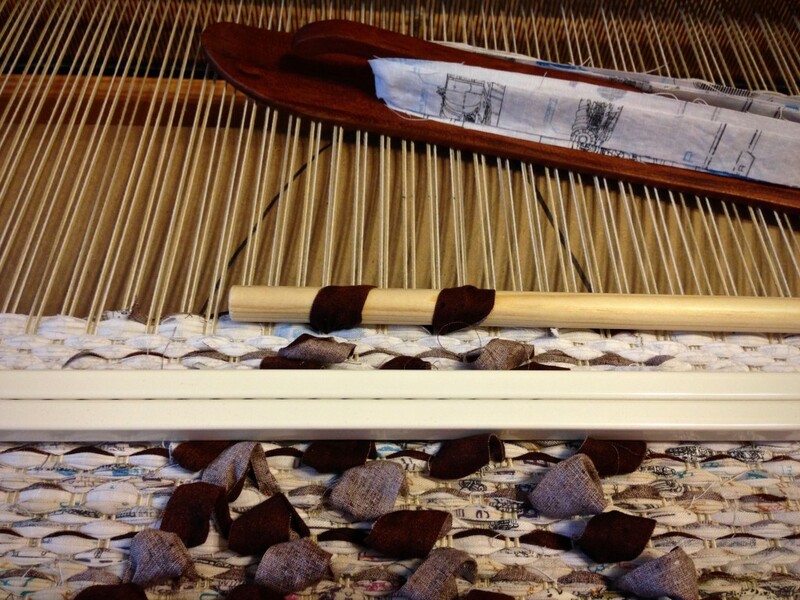 Dressing the loom starts with pre-sleying the reed. Ski shuttle holds doubled weft–fabric cut into 3/4″-wide strips. 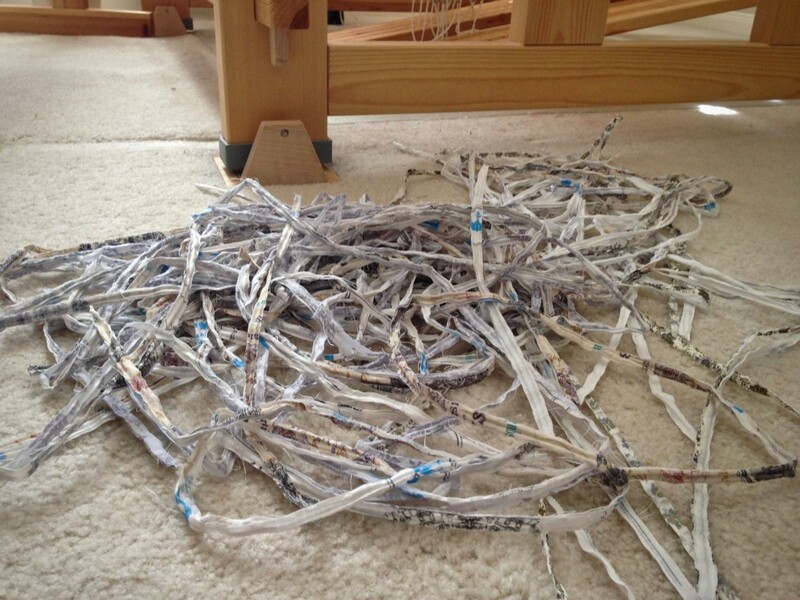 Three different lengths of fabric strips are used for making the rya knots. Loops are made with the help of a wooden dowel. Brown paper cartoon under the warp has the outline for the pattern. Lines on the cartoon, showing where to change the inlay technique, are inked onto the warp as a guide. 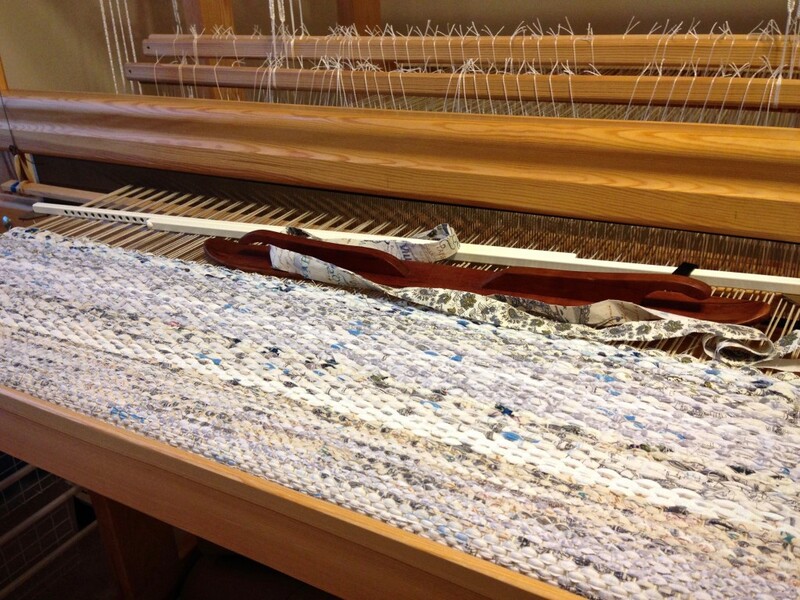 After weaving a sample at the very beginning, I re-sleyed the reed, spreading the warp ends further apart. Excess warp ends, because of the increased width, are chained on both sides. Future band loom warps? Don’t ask. Almost finished weaving, and another do-over happened. Cutting off! Time to celebrate!! Sculpted inlay appearance is achieved by graduated lengths of the rya strips and heights of the loops. May your design inspiration come from unanticipated places. 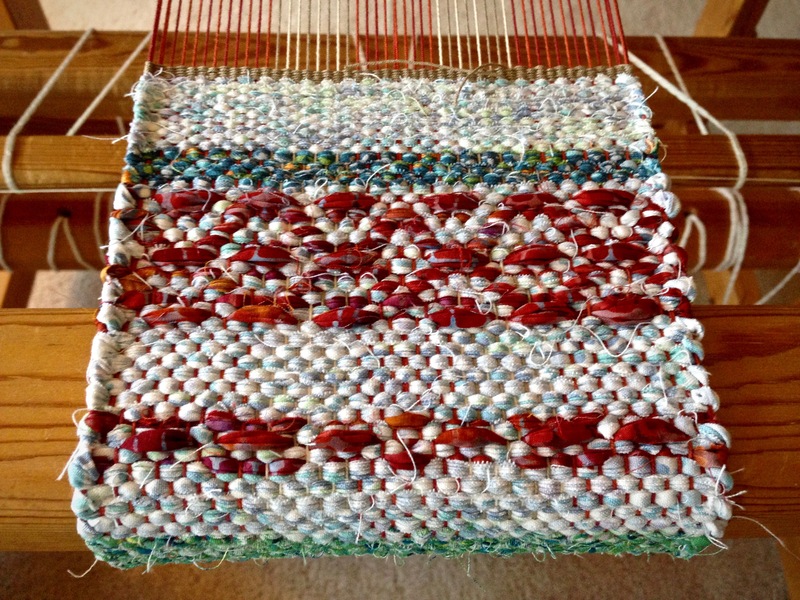 I’m a relatively new weaver and so enjoy your blog posts – my favourite weaving blog and because you post so frequently I feel as if I’m there with you in your workshop. I’ve learnt so much from your posts and and often refer to your weaving tips. 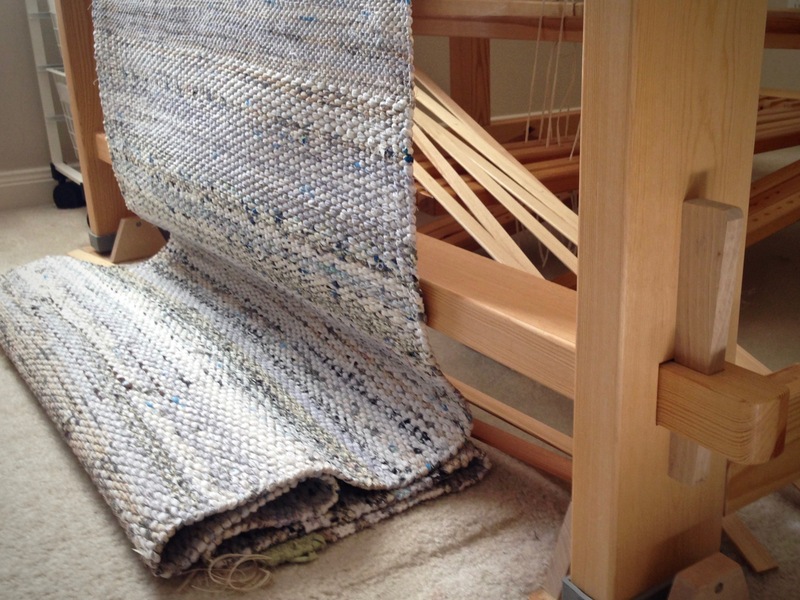 I’m in the process of becoming familiar with my Louet Delta countermarch loom – treadling and tie up is all new to me and I’m finding it quite challenging but strangely enjoyable. (perhaps not enjoying all the pulling out and reworking!). 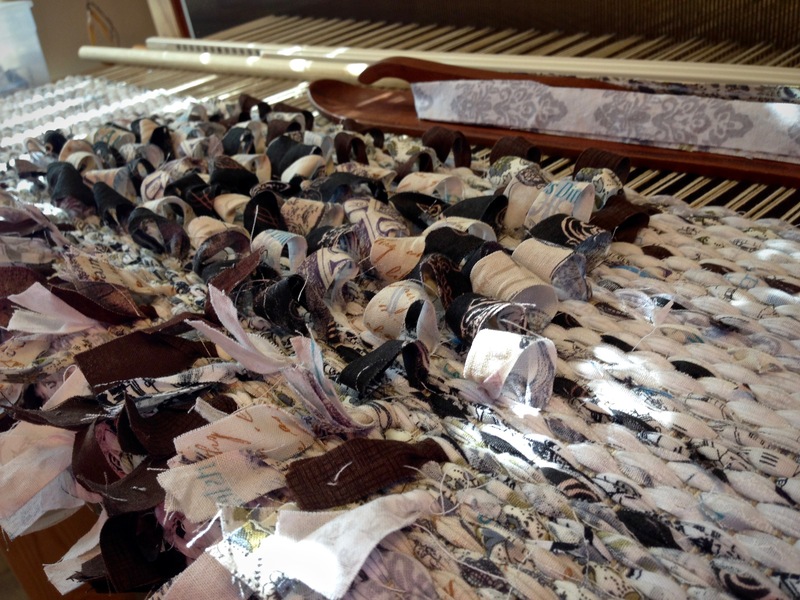 Your rag rugs are beautiful and your recent linen weaves – a great source of inspiration. It’s a pleasure to meet you! I’m thrilled to hear that you find useful things here. What a wonderful camaraderie we handweavers have as we struggle and learn how to do this thing called weaving. Thank you so much for taking time to leave your thoughts! Hello, thanks for sharing your weaving , Is really good to know that it doesnt always go as we planned. But it encourages me to keep going. I love your rug. and will try the technique ( rya, inlay) out on my next . enjoy your weaving, it the greatest hobby ever! Hi Shirley, I hope you do try the inlay techniques, and have as much with it as I have had! Hi Sharon, It’s wonderful to have you along for this exciting journey of weaving! Oh Karen, it is beautiful, what a great design! I know of another woman who gets inspiration in strange places, she went to Italy and spent a lot of time taking pics of floors for quilts! I think she even did a book on it!! Thank you for all your wonderful posts!! Thank you so much, Liberty! I’m glad you like it. There are so many places to find design ideas, if only we think to look. I enjoyed this fabric strip rya more than I did the wool yarn rya that I did previously. I like the whimsical, fun look it has. I look forward to seeing your pictures. No hurry; take your time. I too am a fan of your blog and have learned lots. Thanks so much for sharing your knowledge. Love the rug. Hope you won’t use it as a bathmat!. It’s too beautiful for that. Hi Anne, I’m glad you’re with us. This rug is a little too big for a bath mat anyway. I have decided to hang the rug, where it will make a statement as you come into our home. Thanks so much for weighing in! 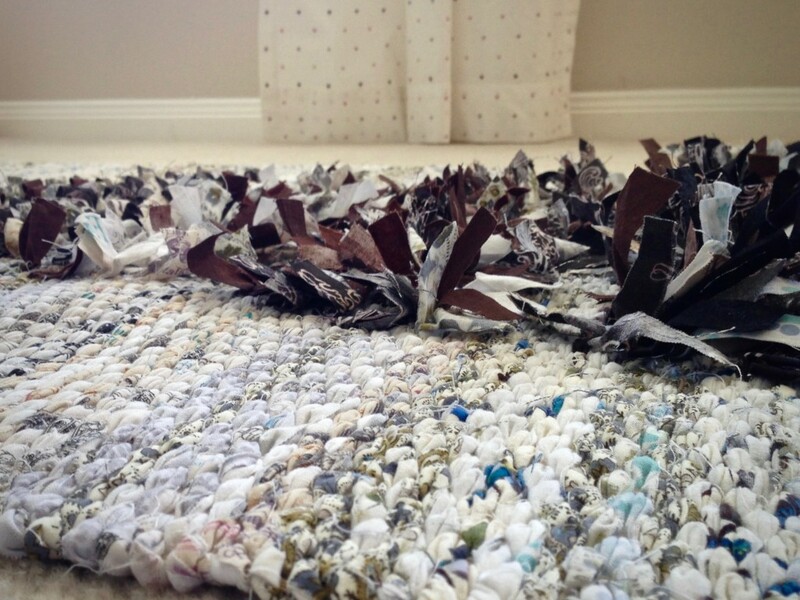 I am calling this miniature rag rug experiment a success! Oh what fun to play with colorful fabric to make rosepath designs in rag rugs. This sample size is great for trying out various designs and color combinations. Pure delight for a rag rug weaver like me! 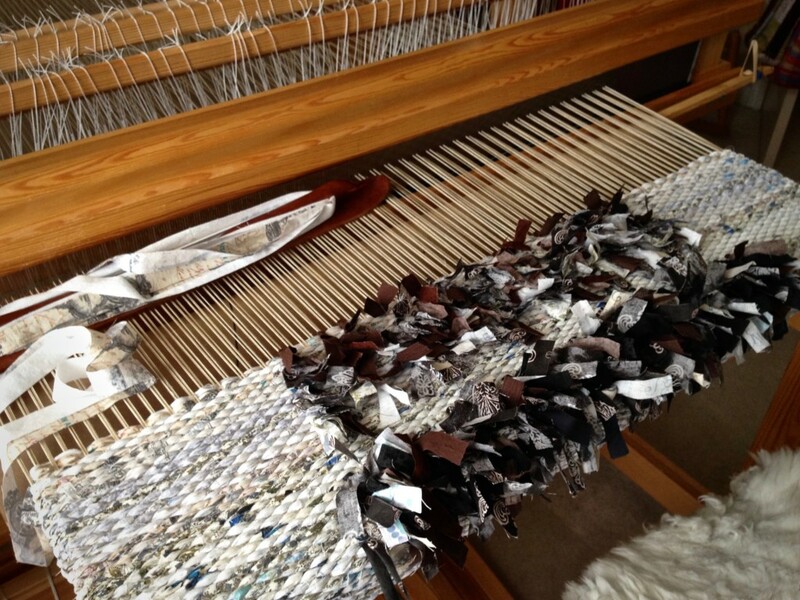 Mini rag rug on the loom with rosepath design. I am cutting this first “rug” off. After finishing the ends and hemming the little rug, I will see if adjustments are needed before weaving the rest of the warp. It’s the details I’m interested in–sett, weft density, finished dimensions, selvedges, design, balance of color, size of hem. All of these assessments affect my plans for the remaining warp. I am excited about weaving more of these mini rugs! I smile to think of it. 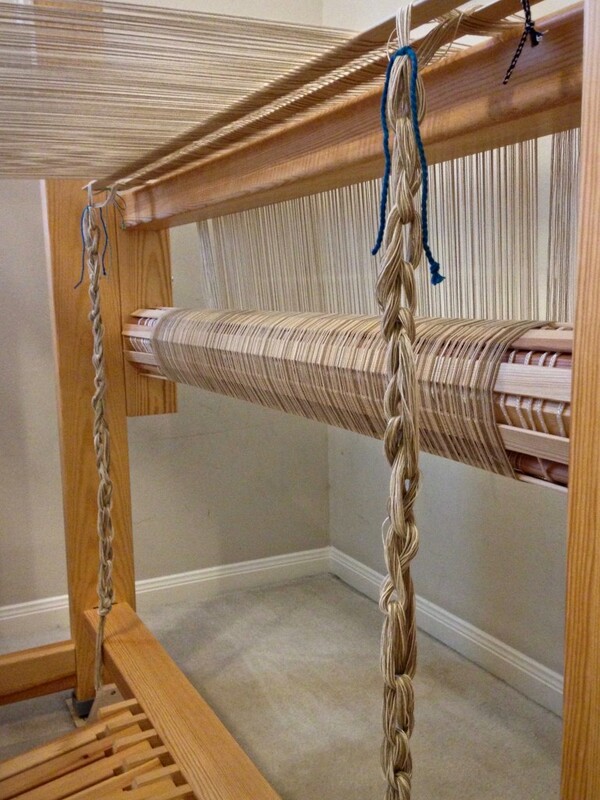 Warp is tied on and ready for weaving the next small rag rug. 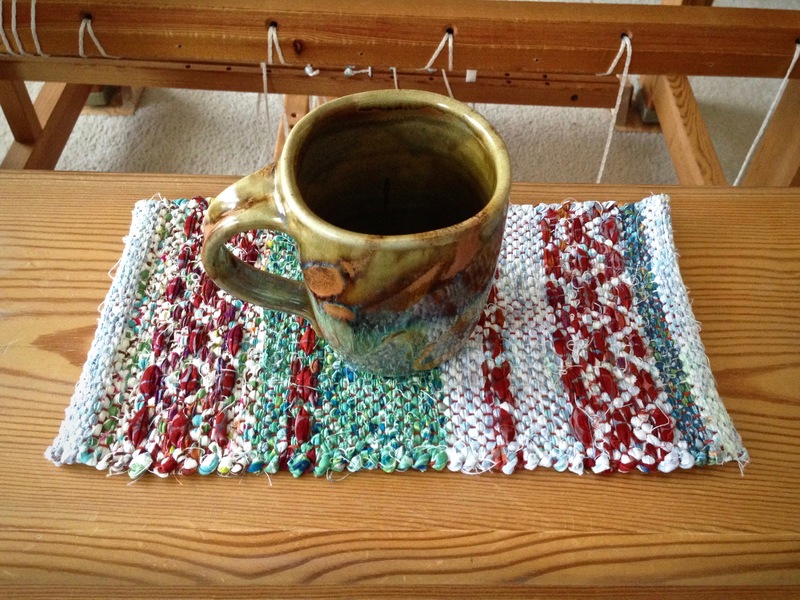 Favorite artisan coffee mug is right at home on the cute little rug. Finished rag rug measures 6 x 10 1/2″ / 15 x 26.5cm. The Lord is intricately involved in the lives of those who belong to Him. He delights in details that require His guidance. It is as if the Lord is holding my hand, especially when I need guidance to navigate life’s challenges. The Lord delights in helping us. After all, what He is making is much more exciting than anything found on our looms. May you find delightful details in the work of your hands. Never thought of sampling rugs. Good idea! Patterns and colours for rosepath; going to do that! Thanks. Hi Fran, I’ve been wanting to try this for quite some time. Finally, my loom is available to do it, and I’m having fun with it! How many epi do you do? I’m using a metric reed on this one. It’s a 30/10 reed, so 3 epc. If I use a reed measured in inches, for rag rugs I use an 8-dent for 8 epi. I like the metric reed because it’s a slightly denser sett, but the 8-dent works just fine, too. Very nice! I’ve never done anything but plain weave for rag rugs and runners. And I do delight in buying funny and fun fabrics! I wait for them to go on sale at a place like Joann’s and get a big stack and the cutting lady wonders what on earth I am making with all the kooky prints. Debbie, I get the same fun reaction when I buy yardage for rugs. They always wonder what I am making. And I love to tell them. “The Lord delights in helping us.” Sigh. I needed to be reminded of that, Karen. Thank you! I’m glad the reminder was timely for you. It’s a reminder I’ve needed, too. Storm Troopers in a Rag Rug? There are some crazy prints embedded in my rag rugs. I buy cotton fabric in five-yard lengths. When I scan the fabric bolts at the store, I look for specific colors and interesting patterns. More prints make it into my rugs than solid colors. 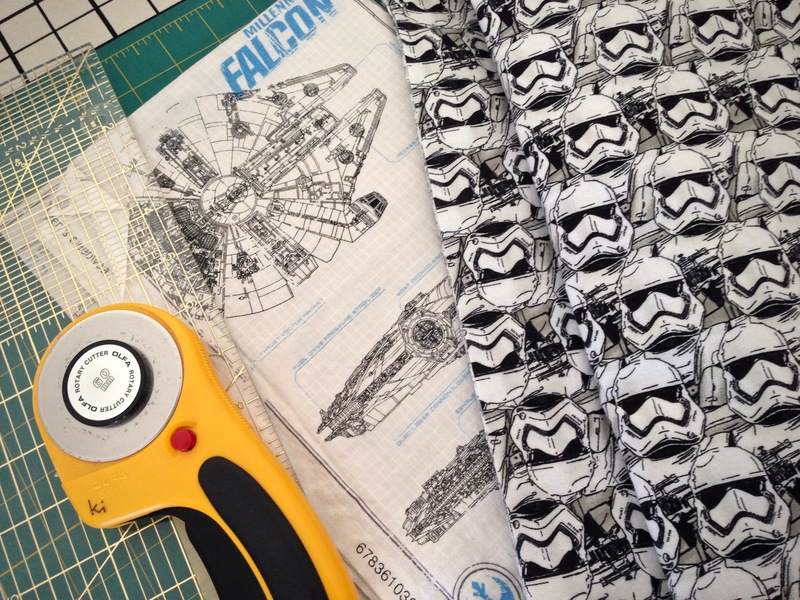 Drawn to a bolt of fabric with a touch of blue on a mostly-white background, I was surprised to find the popular sci-fi vehicles in the print. Storm Troopers can hide in plain sight on this rug. Unusual prints can add hidden surprises to a rug. Take Star Wars prints, for example. No one will know that the Millenium Falcon or Storm Troopers are in the finished rug. 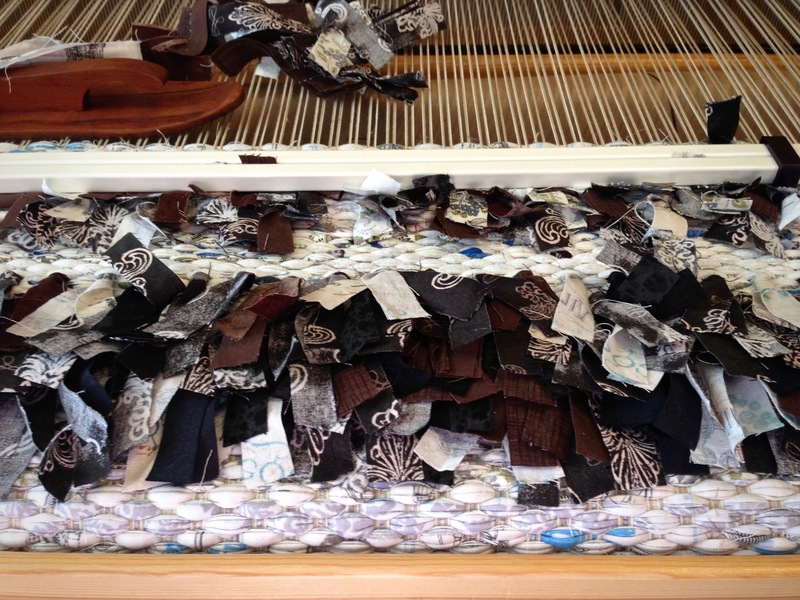 After all, the fabric has been sliced into strips, and is used only intermittently as weft and inlay. But the weaver… she knows, and smiles about it. Am I a Star Wars fanatic? No, not by a long shot. I selected the fabric for its colors and effect. I wanted to make something new out of these popular movie prints. Where are the Storm Troopers? There are a few hiding among the rya strips, and some are in the weft rows that stand out as black and white. 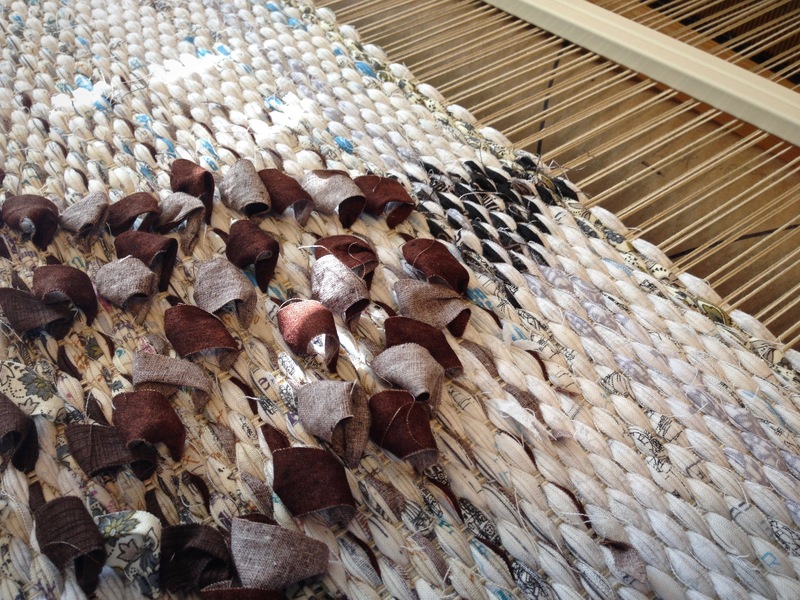 Loops are created on the rug, using a wooden dowel. And a five-yard strip of Millenium Falcon fabric waits on the ski shuttle, ready to be hidden in the weave. This is what our Savior does for us. Jesus takes us as we are and makes us completely new. We each come marked with unusual prints, and wonder what can be made of us. Jesus is not patching and fixing things, leaving us in our original state. He is making something completely new. Our personality and individual features are still there, for our Grand Weaver finds a way to make them into something good. Perhaps he smiles at the thought. May your unusual prints bring a smile to your Maker. I love a challenging project! 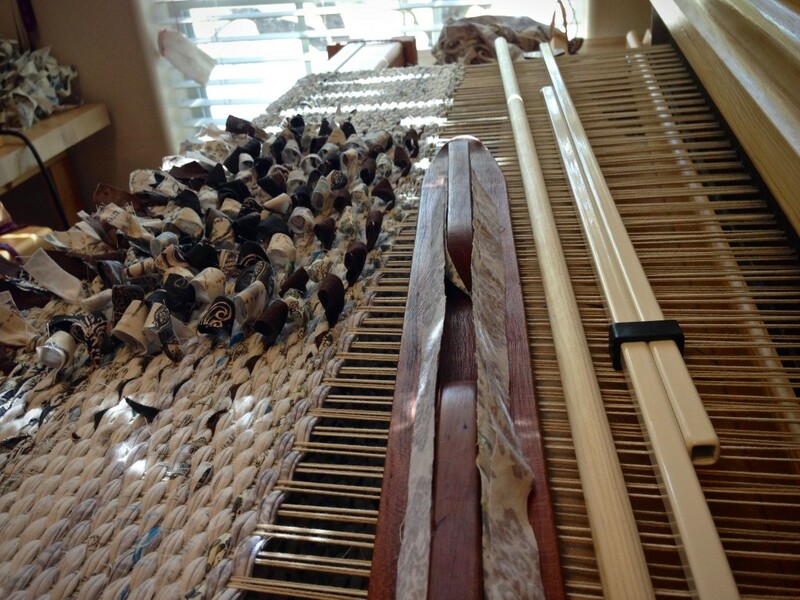 It is marvelous to have something on the loom that takes effort, concentration, and problem-solving skills (as long as there aren’t too many problems to solve). 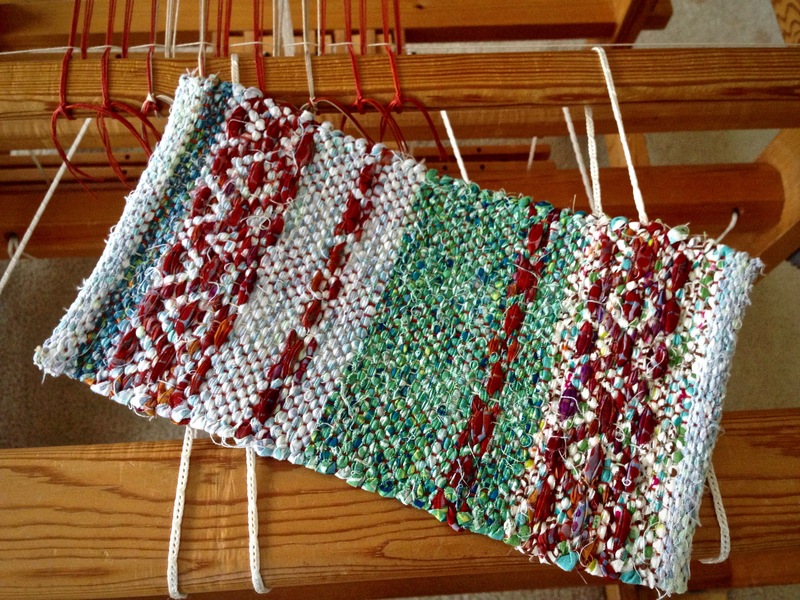 This inlay rag rug project includes all of the above, and it’s on the big loom–my favorite. This is handweaving at its best! Rya knots slow the weaving process. 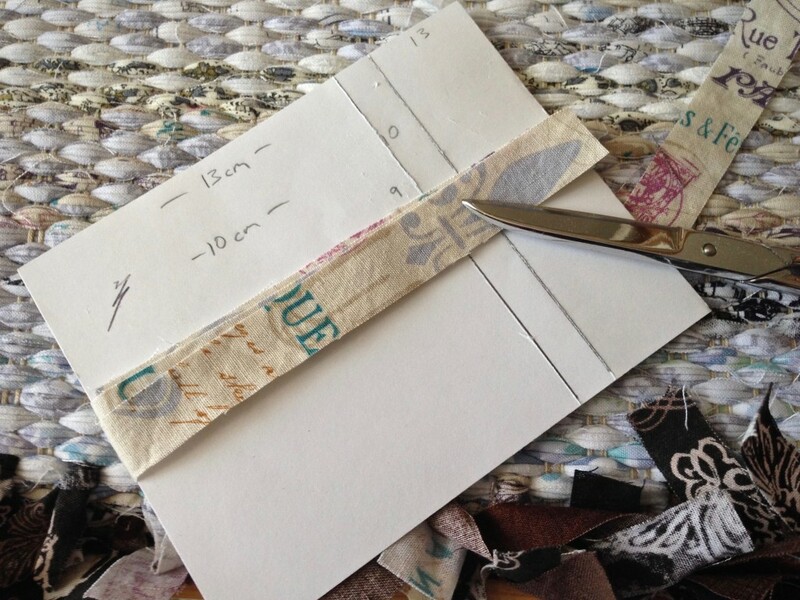 Fabric strips are cut to a specific length and the cut pieces are hand-tied around pairs of warp ends. I am constantly evaluating the pattern, and making needed adjustments with color in the background and with the rya, and spacing the rya knots. Is this working? Or not? Take out a few rows, try putting something different in, step back for a better overall view. Moving and thinking, and beating it in hard, like it should be for a rug. The momentum of the hanging beater makes the hard work easy. And fun. Weft is firmly beaten in. The momentum of the hanging beater provides the strength I need to be able to tightly pack in the weft. Ability by itself is not enough. Wisdom works with ability to produce craftsmanship of highest quality. Our Creator gives us insight that enhances our natural talents and learned skills. When wisdom partners with ability, creativity flourishes. And what a joy it is to be in the middle of that process. May you excel in joyful creativity. Having “the awareness of where our true creativity comes from” is a major factor in finding enjoyment in this weaving journey. Thanks for your input! Thank you for sharing your natural talents and sharing that it’s given to us by our Blessed One. Sharon, I am so pleased to have you share your thoughts! Our natural talents are gifts for sharing with others, right? If we keep them to ourselves, we really don’t have much chance to grow and develop. Karen: some of us don’t have that wonderful Swedish machine your doing your very creative rug on. 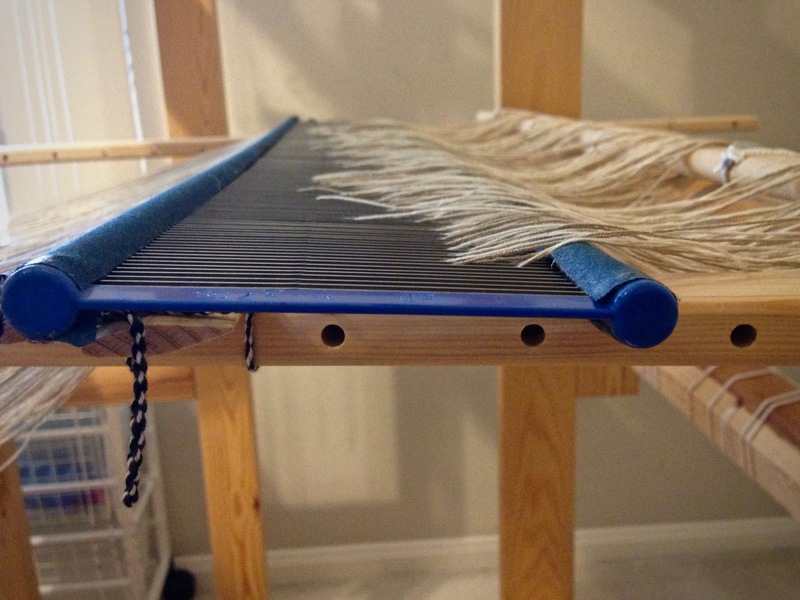 sooooo for those of us with jack looms here is a hint to getting enough “umpha” to pack that weft in as tight as Karen’s. Get a 1″ square metal bar as long as your beater bar, drill holes in it to match the tightening screws that hold the reed in place, get new screws long enough to go through the beater bar and the metal bar. 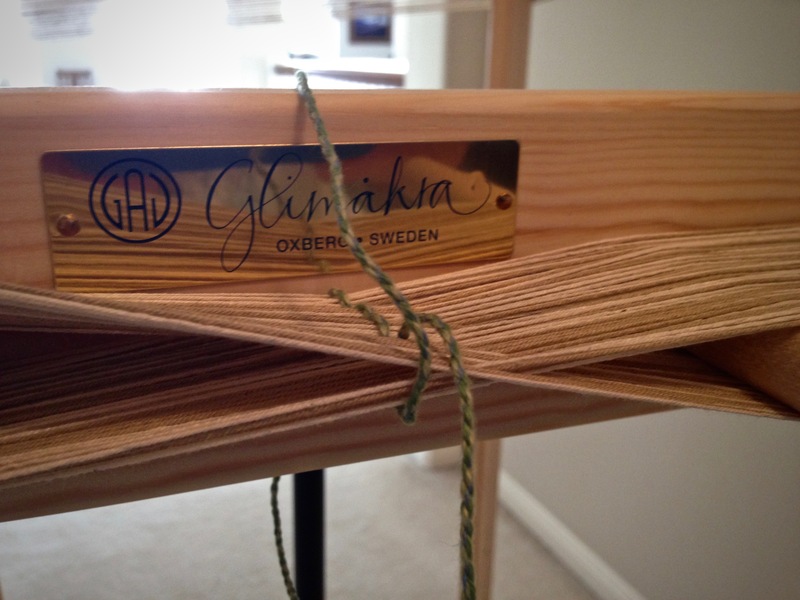 Now you can add weight on the back side of the beater bar and “umpha” to pack that weft nice and tight. Linda, I’m very grateful that you are so willing to share your knowledge and experience! 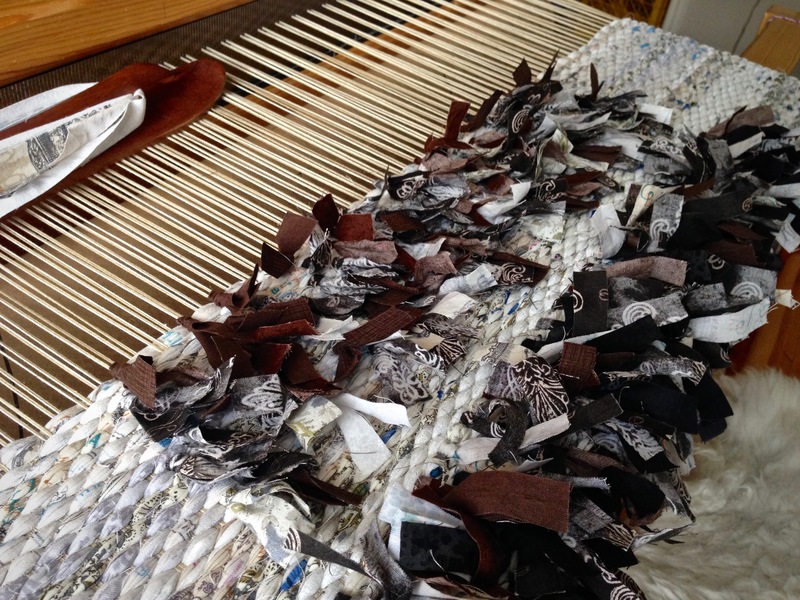 I have an enormous brown paper cartoon hanging under the warp, suspended by a contraption of wood, string, and rubber bands.The pattern area of this rag rug begins with rya knots. The dark colors of the rya pile contrast with a background of whites, off-whites and light prints. The rya knots follow a geometric design that I drew onto the brown paper with a Sharpie. 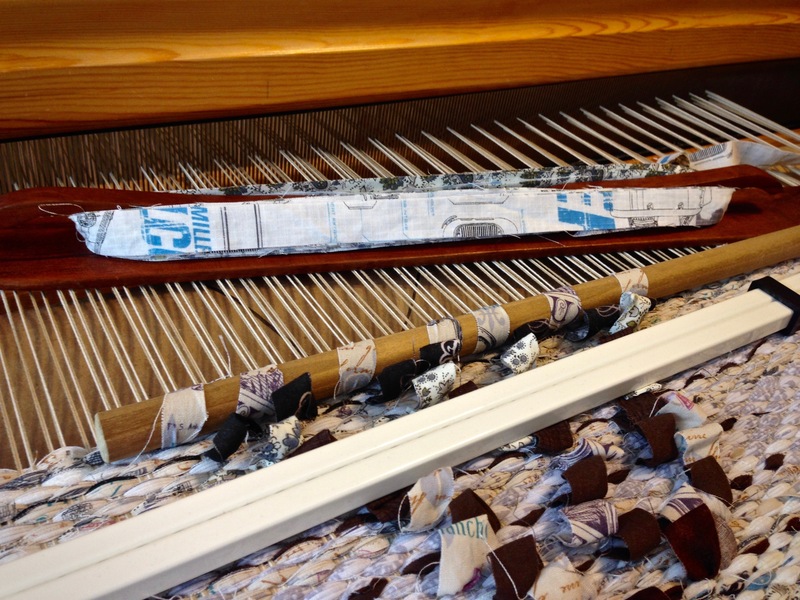 Brown paper under the warp hangs over a slat which is suspended with seine twine and rubber bands. As the designer and weaver, I already see the finished rug in my mind’s eye, and understand what is needed to complete it. 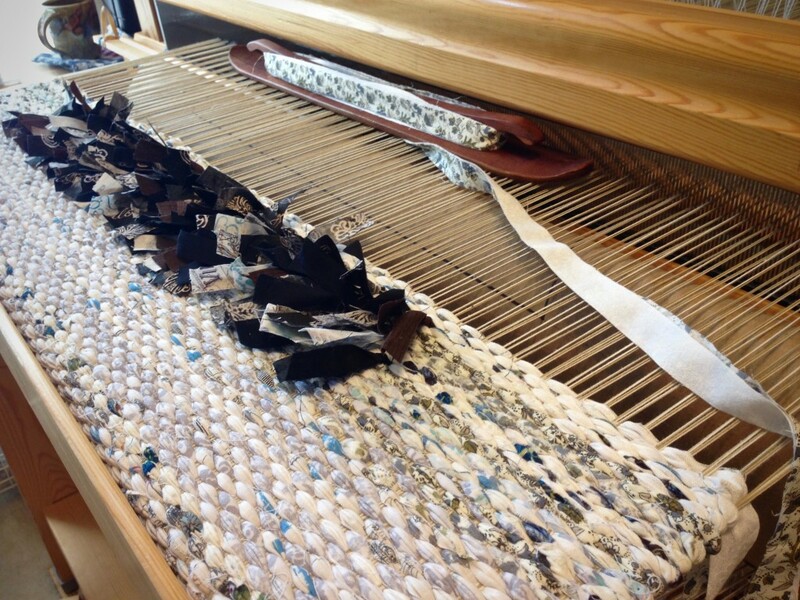 I am weaving this rag rug for our own home, so naturally I am already thinking about where it will be placed. This makes it personal, and the slow weaving process grants me the opportunity to know this rug, inside and out. Tightly-woven selvedges. 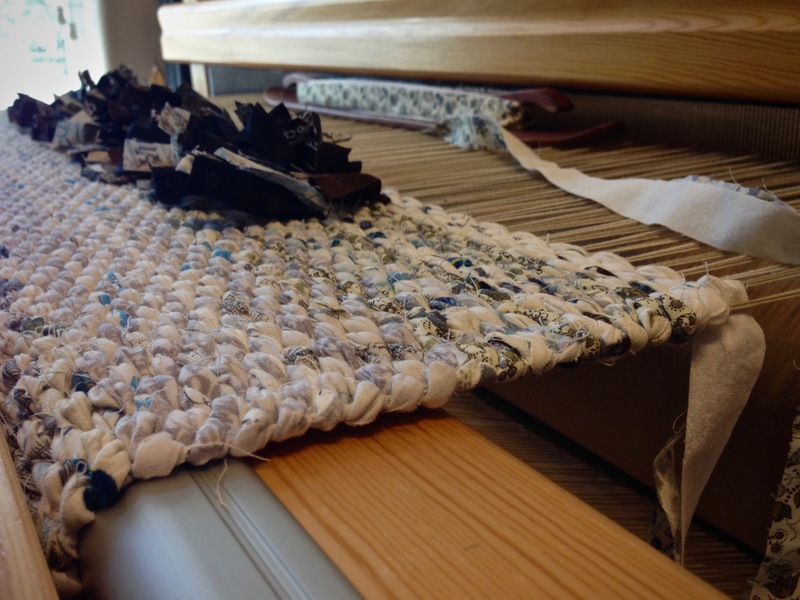 Doubled weft gives extra fullness and weight to the rug, as well as contributing to strong rug selvedges. Yes, it is important for me to know my Maker, but even more important that He knows me. All of life has meaning when God knows you by name. He knows what is needed to give our lives purpose. And the slow process becomes that much more personal as he weaves the design that he has seen all along. May you accumulate many meaningful moments. And it is very possible that I may “adjust” the design as I go. That’s the great advantage of being designer AND weaver! I would really like to see a post of this finished please? I have made rag rug bags but not a rug yet, will have to be next weaving project! I will show the rug when it is finished. You can count on it! Thank you for asking!